This recipe was modified (barely) from a recipe I found in the April 2015 edition of Cooking Light. The fennel and orange salad is beautiful and light and perfectly pairs with the very simply prepared pork. It screams, “Spring! Spring is here!” It’s also a very attractive and easy meal to put together. I served it with a side of Trader Joe’s Harvest Grains Blend, which is a blend of Israeli couscous, orzo, baby garbanzo beans and red quinoa. 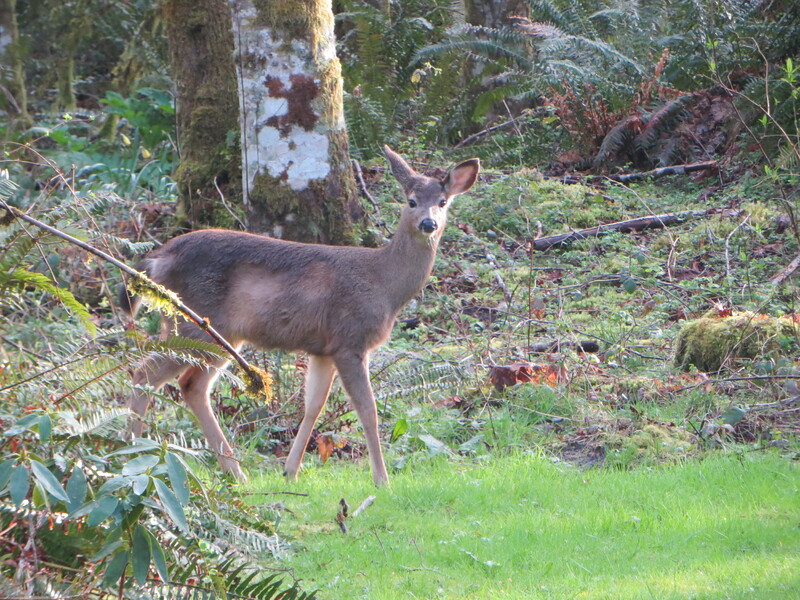 First, a couple of pictures of the deer that wandered through our property as I began cooking. I love that it’s light in the evening and I can see them again. I don’t love that look they give me. The, “Hey, lady, plant anything tasty I might like to eat?” look. I buy this…I call it “deer stink.” The “official” name is Liquid Fence. Perhaps you’ve heard of it? It’s uber stinky. And the deer don’t like it. So, when they’ve chosen something to chomp on I pull out the stink and spray it on. The problem with the spray is if the wind is blowing even the slightest…and I’m downwind. Too many times have I walked into the house after applying deer stink and went, “Sniff-sniff….man! I smell like deer stink!” It is potent. Like rotten eggs on steroid mixed with something very dead that your dog might roll in. Ahhh, how’s that for an introduction to a tasty pork chop meal? Perhaps not the best story to tell right at this moment. 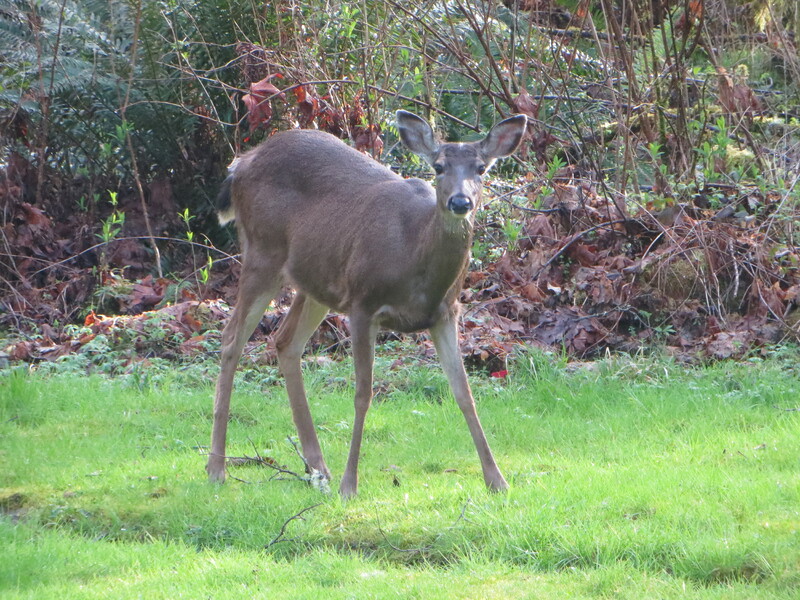 The husband and I have an unspoken agreement with the neighborhood deer: do not enter the perimeter of the yard. You may eat whatever you find outside the perimeter, you may not enter the perimeter. They comply with this rule….when we’re home. The problem is we both work full time. You get the idea. There is many a story out there about how to keep deer away. At one time or another I think my Dad has tried them all (cds hanging from trees, blood meal-which did keep the deer away, but the dog was a little too attracted to the stuff). He’s pretty much given up. If there is something you truly do not want the deer to eat you do one of two things: fence it or don’t plant it. Let’s get to those chops! Season the chops and set aside. 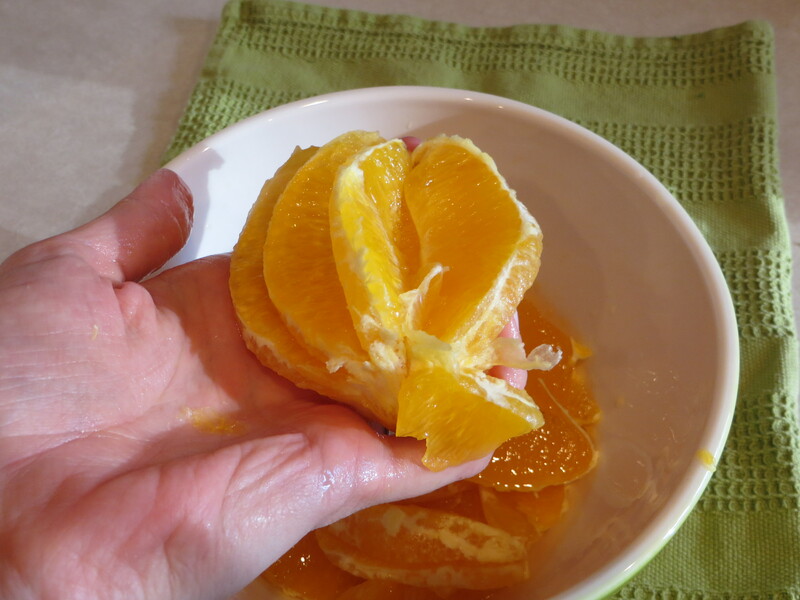 Peel and section the oranges over a bowl, catching the juice along with the orange slices. 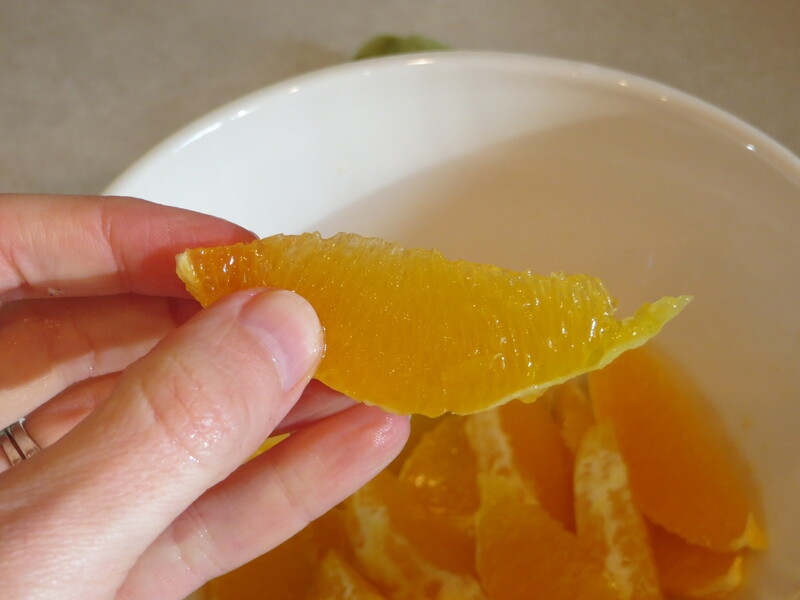 I did the cut that I learned back in good old 8th grade home economics: peel the orange and use a small paring knife to cut between the membrane, leaving you with neat, non-membraned slices. 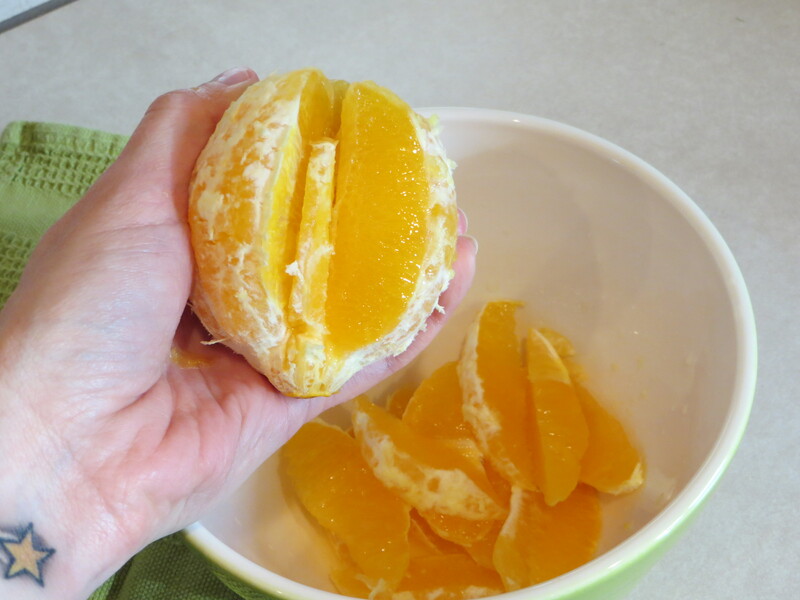 The picture on the left shows the technique in-process, the one on the left shows the remnants after cutting out the slices. I squeezed the juice from the remnants into the bowl. 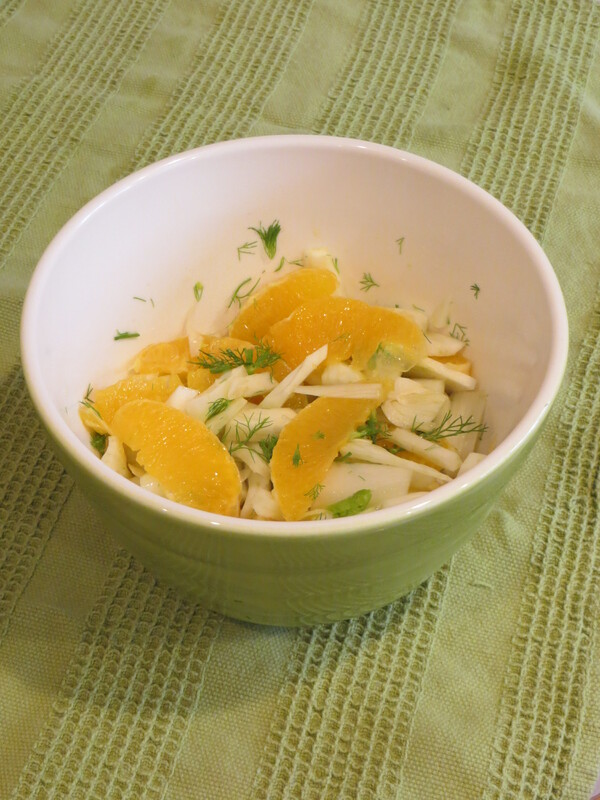 Thinly slice the fennel and combine with the oranges, honey and vinegar. Chop some fennel frond and add for a pretty green touch. Heat a pan over medium high heat with a little bit of olive oil. Cook the seasoned chops for approximately 5 minutes on each side.